The beta-testing is over! Introducing, "Double Mallets". These are mallets with a large (32 to 38mm) superball on one end and a smaller (25mm) ball on the other. The advantage is you get two mallets in one and the ball you're not using acts as an endcap, balancing the weight of the mallets and making the mallets less likely to slip out of your hand. $18. per pair plus $7.00 Priority shipping for up to two pairs. (Write me for quantity discounts on shipping.) They sound great on drum kits, congas, bongos, djun djuns, taikos, frame drums, etc. Half the mallets I sell are bought for kids 3 years old and up because you can use them to play tabletops, refrigerators, file cabinets, doors, walls and floors without damage. STILL the only superball mallets made that come with a guarantee that the ball won't fly off the shaft. Over the years, through much experimenting, I found ways to improve on the playability, balance and durability of my design...and my superballs won't loosen and get flung from the stick. No one else makes that claim. 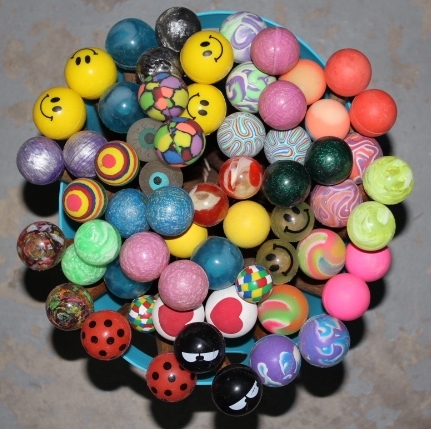 My original superball mallets were the yellow smiley face design. I was about to do a gig and the idea of a big guy playing three big, serious African drums with smiley face sticks struck me funny. Years later, when my son was a toddler, I made him my first glow-in-the-dark mallets. I had no idea how popular my mallets would become with kids! They love the designs and being able to drum on hard surfaces (without marring them). For serious drumming, my superball mallets are great for playing frame drums (bodrans, tars, tom toms, shaman drums, etc.) Native American-style. They sound and feel great on congas, bongos, kpanlogos, ashikos, djun djuns, talking drums, timbales, tongue drums, timbaos, log drums and gathering drums, too. I learned to make Native-American-style drum beaters from my friend Grey Wolf, who taught me the importance of letting my creativity loose so that a part of my spirit was in every drum and beater. I enjoy building beaters. I don't make two exactly alike, prefering to have them exist as modest, but original, works of art. They are as expressive just hanging on a wall as they are when tapping out a rhythm on a drum. I tend to favor covering the beater head with fur as it makes a more mellow-sounding and expressive beater...capable of speaking in a whisper or singing out with joy. I use only the highest quality materials in my beaters including the hardwood core, natural furs, leathers and suede...Decorated with gemstone, metal, glass, wood, resin or ceramic beadwork, braided jute, braided horsehair, feathers, cloth, rawhide...whatever it takes to give the beater it's individuality and spirit. Please go to Rick's Gallery homepage and sign my guestbook.